EXCLUSIVE INTERVIEW: Jimmy Carter congratulates Panama on a “superb job." 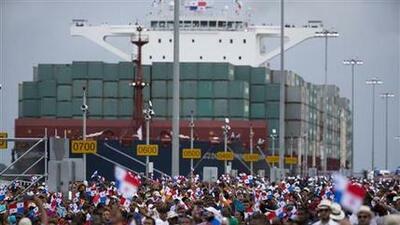 Panama inaugurated larger new canal locks on Sunday, doubling the capacity of the strategic waterway. Carter says history proves he was right to sign the historic 1977 treaties that gave Panama control of the canal. When president Jimmy Carter signed the Panama Canal treaties in 1977 handing over control of the strategic waterway, he came under heavy criticism from conservatives at home for a risky give-away of what many considered a vital U.S. asset. Now, almost 40 years later, as Panama inaugurates a massive $5 billion expansion of the canal's locks to accommodate larger ships, Carter says he is proud of his decision to begin the process of giving Panama back its full sovereignty. "I’m excited and pleased and very grateful that the Panamanians have done such a superb job, not only in operating the canal but in increasing its revenue and at the same time expanding its capacity," Carter told Univison News in an exclusive phone interview on the eve of Sunday's inauguration of the new locks. "They’ve just exceeded my own very high expectations on how well they have taken care of the canal and used it properly," he said. On Sunday, amid fireworks and waving flags, a large Chinese cargo ship carrying more than 9,000 containers entered the newly expanded locks that can accommodate ships that carry up to three times the cargo of those previously able to use the canal. Carter, 91, said he believed at the time that handing the canal over to Panamanian control was the right thing to do, both morally and for the sake of improving U.S. relations and the prospects for democracy in the Americas. A stunning engineering feat in its day, the canal was built by the United States in 1914 a decade after the creation of Panama, a country carved out of Colombia in a notorious piece of gunboat diplomacy a decade earlier. "In this hemisphere, every country soon became a democracy rather than a dictatorship ... because of our human rights policy, so that was a major change that took place. I am very grateful for that," said Carter who was a one-term president from 1977 to 1981. Carter said he considered the canal treaties, signed with Panama's strongman Gen. Omas Torrijos, an important part of his presidential legacy. It was one of the high points," he said. "It was an example of the legitimacy and need for a very strong human rights policy first of all. It showed that we had confidence in the Panamanians people and were willing to treat them fairly," he said. While the canal was run by the United States it was operated on a non-profit basis with surplus revenue pumped back into maintenance. Since passing to Panama's control at the end of 1999 revenues have grown six-fold said Carter, providing an important boost to the Panamanian economy. "They put in a very professional group of operators in charge of the canal and that has helped a great deal," Carter said. "Now Panama’s GDP (Gross Domestic Profit) .... the average income for individual citizens in Panama, has skyrocketed, primarily because they have managed the canal so well," Carter said. The 1977 treaties also gave Panama 360,240 acres of prime real estate that made up the former Canal Zone, a fenced-in U.S. civilian and military enclave of military bases and housing for U,S. soliders canal employees. The former Canal Zone has since been developed into highly sought-after residential and commercial neighborhoods. "The Panama Canal Zone which we used primarily for a military base they’ve used for commercialization and improving the lives of all the Panamanians. So it’s been a very good improvement and they’ve been very ambitious about the future," said Carter. It was not all plain sailing after the 1977 treaties. After Torrijos' death the country fell into the hands of a brutal military dictatorship led by Gen Manuel Noriega, a former U.S. ally who was accused of corruption and ties to drug traffickers. Worries over the management of the canal played a major role in the December 1989 U.S. invasion of Panama to oust Noriega, who was later convicted of drug crimes and jailed in Miami. Carter returned to Panama as an electorial observer in May 1989 and played a key role in preventing Noriega from stealing legislative elections. The Atlanta-based Carter Center has since become one of the world's leading election observer groups. "The Carter Center has now monitored more than 100 troubled elections in the world, "Carter said. "We began this process with what we learned in Panama which was our first one. We went from there to Nicaragua and then to other countries in Latin America and now all over the world," he added. "So Panama has been an example to me in many ways in promoting peace, human rights and democracy in a small country and we’ve expanded it to a worldwide commitment."